Makemake pronounced as “maki-maki” is the last of the dwarf planets and plutoids to have been officially announced. Makemake was discovered in the Kuiper Belt in 2005 by Mike Brown, Chad Trujillo and David Rainowitz and only recently has been formally named Makemake after the creator god from Easter Island mythology. Prior to the official name the plutoid was nicknamed Easterbunny. Makemake is slightly smaller than Pluto and we believe that it takes 310 Earth years for Makemake to complete one full orbit. 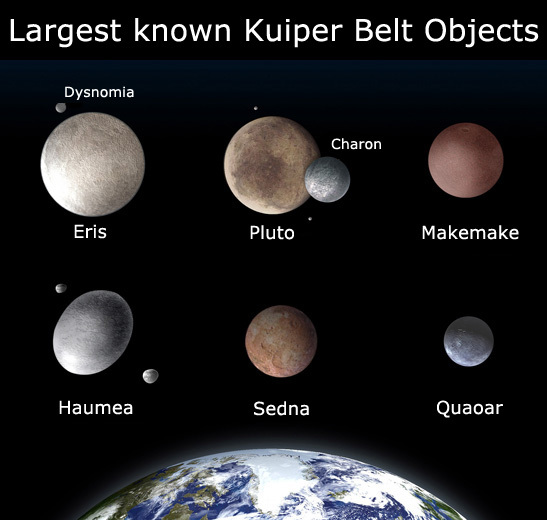 Makemake is one of 3 dwarf planets found inside the Kuiper Belt in a constellation called Coma Berenices, a region that is found just outside Neptune. Astronomers have estimated that Makemake is 1,500 km diameter and it does not have any satellites (moons in orbit). The average orbital velocity of Makemake is 9,828 mph. Makemake is the second brightest object in the Kuiper Belt, after Pluto. It is not possible to see Makemake in the night sky with the naked eye but you may be able to see it with a good quality amateur telescope. Frozen nitrogen, frozen ethane and frozen methane have all been detected on the surface of Makemake. The discovery of Makemake along with Eris was a major factor in making the International Astronomical Union look at how they decide what is and what isn’t a planet. After these discussions both Makemake and Eris were given dwarf planet status.